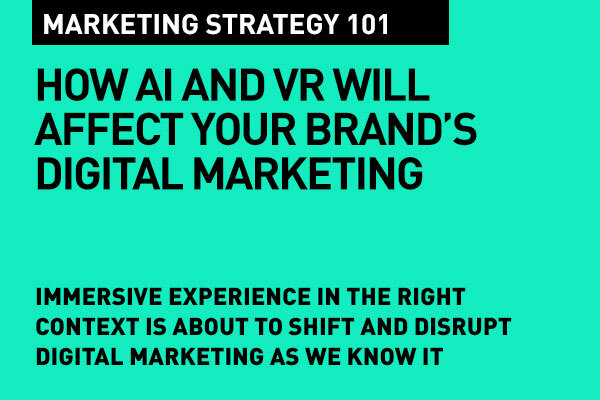 Digital marketing today is being disrupted and we see a shift in how brand's are using both AI and VR in planning a seamless, immersive experience that is truly relevant in context. Brands today need to understand the shift. They are no longer in the B2C business – they are in the C2B business, where the customer drives what brands should be doing. Particularly in the social realm. So, a seamless, omnichannel experience that is rewarding to the user – and one that resonates in context is key. 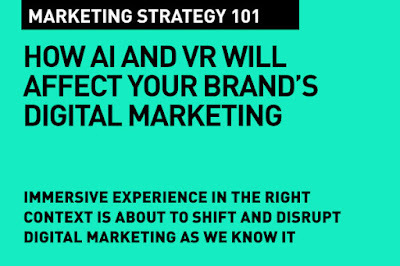 With this paradigm shift in mind, we're beginning to see both AI and VR gain ground in digital marketing. Brands are fast moving into this territory of contextually relevant (and non interruptive) experience that uses VR’s immersive technology along with how AI’s and it's live predictive analytics makes context and content work seamlessly. What most brands are learning quickly is that there are no guidelines just yet. It's early days. The future is now, but we don't know how to negotiate it. So, the key for brands is to learn fast, be agile, experiment and both adopt and adapt. The power of predictive analytics that AI brings can enhance the customer experience by aligning customer or target audience needs to the medium and the message being delivered. This, of course is hugely dependent on how we employ AI to turn data into insight. How we gather data and what we do with it is key – the accuracy of the data and how we leverage it is where AI can really help. Earlier brand marketers guess worked their markets – somehow figuring out how consumers behave. Today, technology enables thin-slice targeting and delivering ads and experiences, and content, based on the target's online behavior. IBM’s Watson runs analytics on thousands of pages per second, collecting and analysing a huge volume of data relating to every ad generated. It also does sentiment analysis down to great detail – including emotions generated during consumption of content. All this in real time. Which enables brands to adapt, make changes on the fly, and make their communications far more meaningful. This is particularly relevant to native advertising or native content – because the success of this kind of advertising is context. AI greatly enhances the possibility of native because it can help place the right content in the right context – including the measurement of sentiment and keep adapting and changing as needed. Even with vanilla advertising, ad blocking is reduced because AI helps with better placement that is more acceptable in end-user context. While AI can help brands configure context, the end experience is still the important thing. No amount of code or algorithm can draw in the consumer if the content fails. At the end of the day, the content needs to engage, tell a story. The inherent power of VR in producing engaging, immersive experiences online is being explored, but the possibilities are seemingly endless. VR is no longer a technology advancement. Google is ensuring that VR is here and VR is now. With a VR viewer in hand (and Google has shipped millions of its simple Google Cardboard viwers across the world), there is no shortage of content. What matters then, is for brands to be able to create purpose-built VR content that will resonate in the right contexts. Google tells us "The promise of VR is what the industry calls "presence"—the feeling that you're really somewhere else. VR cameras like Jump can capture the entire experience of a place—every corner, every angle. In the not-so-distant future, cameras like these will be capturing experiences all over the world. What does this mean for audiences? How about access to the best seats in the house at any event—floor seats at the NBA playoffs, a box at La Scala, front row at the Beyoncé show? Or the chance to visit the most beautiful places on earth, from the comfort of home? It's the closest thing we have to teleportation, enabling deeper engagement than has ever been possible." The trick then is for brands to use VR with AI and combine the two to deliver meaningful experiences. Beyoncé for the pop fan. La Scala for the opera fan. McDonald's for the hungry when they are hungry. And a virtual resort tour from Marriott for someone planning a holiday. All in grand immersive virtual reality. Google reminds us that "VR lets viewers be active participants; they can look wherever they want. When a viewer feels like they are there, they have a greater sense of the situation. Messages become more impactful. "Will VR give viewers an experience that they otherwise couldn't have? The subject matter should truly take advantage of the medium—transport people to a place, immerse them in a world, and compel them to explore. Could you give shoppers a better feel for your product? According to a study from Ericsson ConsumerLab, shopping was the top reason worldwide smartphone users were interested in VR, with "seeing items in real size and form when shopping online" cited by 64% of respondents. This doesn't just apply to retail brands. Cadillac is already using VR to create virtual dealerships. Will your recording environment be rich with things to see? If you're shooting in a simple white room with nothing on the walls, probably not. If you're at a sports event or a music festival, there's likely plenty to see. Will viewers want to continue watching beyond the initial "That's cool" moment? It can be a challenge to get viewers to stick around after a minute or so. Make sure you have a compelling hook that will keep them engaged." So, in conclusion, once we can harness both AI and VR – for the right reasons and it genuinely makes sense for our brand – we can say we have arrived in the middle of this disruption, and we're just OK with it. Please share this post with friends and colleagues. "expressnews, Blogpost, i like it"!! Really very interesting and very valuable information about the digital marketing nice work. Really thankful for this wonderful and informative blog about the Digital Marketing i really liked it. Nice blog about digital marketing and the description about it very amazing I really liked it. Very nice blog, you have done here. It is very useful for Digital Marketing Company. So keep it up and help the visitor. Now you can get the best Digital Marketing Company which helps to boost your online presence in an ethical manner. This post is really nice and pretty well maintained, thanks for it and keep updting yor posts.